Twenty five years have passed since the occupation of Azerbaijan`s Shusha city by Armenia. As a result of the Nagorno-Karabakh conflict, the Republic of Azerbaijan, which adopted on October 18, 1991 relevant documents for the restoration of its national independence, came face to face with the aggressive policy of ethnic cleansing by Armenia. Given that the country which was undergoing profound political, economic and social crisis and finding ways out of from tense situation in Nagorno-Karabakh, has not yet formed its own national army, it relied only on voluntary assistance of self-defense units during defense of Shusha which has high military and strategic importance. 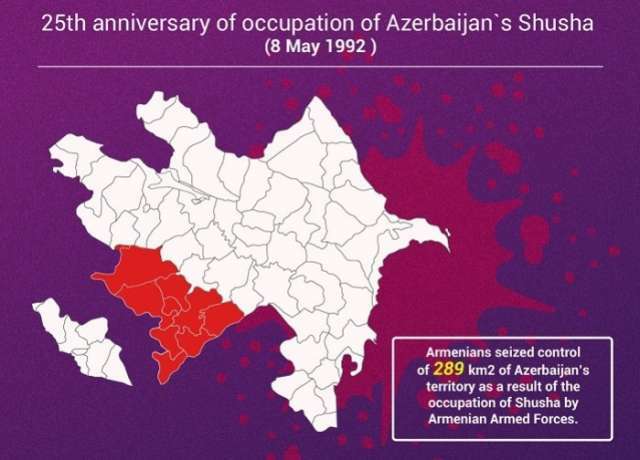 However, despite the fact that they fought valiantly, and had a decent resistance, on May 8, 1992 the Armenian armed forces armed to the teeth occupied Shusha. In the battle for the defense of Shusha, 195 our compatriots were killed, 165 people were injured, 58 people captured and taken hostage. During the occupation the Armenian vandals looted the museums, in which there were thousands of pieces, destroyed hundreds of historical and cultural monuments, defaced shrines and mosques, destroyed a large number of specimens of rare manuscripts, ruined the education and health care institutions.